This is our last week of preschool (for Kaitlyn). We have adored our preschool and will miss it greatly. We are also excited about moving into a new chapter where I’ll be doing school with a preschooler and a soon-to-be first grader. I’m taking this time and using it as a second “new year.” For me, the end of the academic year comes with the same feeling of freshness that January 1 embodies- a chance to reflect, prioritize, and plan next steps. That has meant relaxing my self-imposed posting schedule, deciding on next year’s curriculum, and pinpointing areas I’d like to work on personally. I use an academic paper planner (#teampaperplanner), so I’ve been taking the time to transfer important items into my new planner and savoring the newness and possibilities it symbolizes. Wrap presents. Kaitlyn’s birthday was last week and it was the first time I noticed how much it excited her to actually unwrap a present. I’m the queen of Amazoning gifts to family, but there is something special about seeing a bright and dolled up package begging to be opened that makes it seem a bit more special than a plain brown box. So if it’s not super heavy and expensive, I’d really like to take the time to wrap presents I give to the people I love this year, even if my wrapping skills leave much to be desired. Write down all birthdays and important dates at one time. I usually go through and write down all the birthdays of good friends and family, but I’d like to scribble in other important dates as well. Anniversaries, losses, personal celebrations, etc. I’ve experienced the warm feeling of people remembering milestones in my life and would love to return the sentiment. Bulk buy gifts in advance. Recently I was at a friend’s house and she mentioned her gift cabinet where she keeps multiple gifts for kids a a range of ages. She said every year after Christmas she bulk buys the craft and science kits when they go on super sale, then stores them for when she needs them for birthdays and other celebrations throughout the year. Brilliant! She does the same with adult gifts, buying when they go on sale and then storing candles, kitchen goodies, and other knickknacks until she is in need of a gift. How nice it would be to have these all on hand and not feel the need to rush to Target at the last minute (speaking from experience here…). Pre-stamp envelopes. I’ve had it in me lately to pay kindness forward. One way I’ve been doing this is sending one letter a week to someone that has impacted me, someone that needs cheering up, or someone I’m just thinking of. I’ve found I’m much more likely to do this if I go ahead and have personalized stationery on hand and pre-stamp the envelopes. For some reason, that small step makes a big difference. Consider all my options and ask for outside perspective. I think it’s probably obvious I have been going through a period of self-reflection and planning. I’ve been trying to figure out a routine for our new school year (that will officially begin in August, though we will continue on a light schedule through summer). I thought I had considered all options and was frustrated that it looked like I just couldn’t fit in a consistent exercise time. 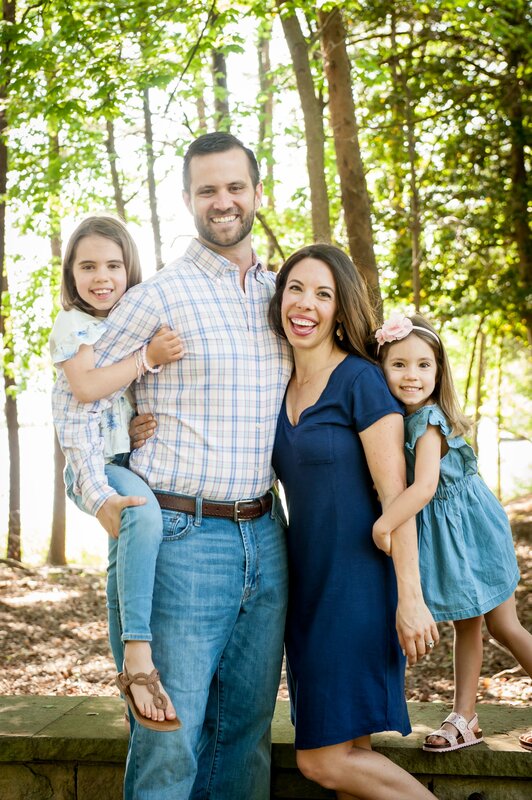 I talked it through with David and he pointed out a very simple solution, but one I hadn’t considered because I didn’t feel like it was a real option due to mom/teacher guilt (it involves starting school an hour later instead of right after breakfast). It made me realize how easy it can be to go straight to “I can’t” or “but it’s harder for me because” rather than to truly examine all possibilities available to us. Big choices aren’t easy but no matter our circumstances we all have options. I’d like to stop being unintentionally stubborn and really take a closer look at all of mine before choosing a path forward. Continuously clear out our living spaces. I’m still amazed at the fact that the living spaces I overhauled using A Simplified Life method are still clean and organized. <the master closet> <Hailey’s bedroom><the kitchen desk and our bathroom> I have no doubt it’s because it forced me to get rid of my stuff, not just pile it up neatly. I’d like to continue to continuously get rid of things that do not serve us. Buy less but buy better. On the flip side of the coin, I’d like to continue to commit myself to buying quality over quantity. After much deliberation, yesterday I bought a full-priced Pace Rival Skirt from Lululemon. I hesitated for a quick second before shelling out $68 but I LOVE it. and I will probably wear it to swim team everyday this summer. Considering clothes on a cost per wear basis puts a lot in perspective for me. Live unapologetically. What is it about social media that makes me feel like I need to pick a side on all issues? It feels like I have to decided whether I’m green/crunchy or not. I’m either a from-scratch health-minded cook or I’m not. I live life much more in the middle than at an extreme in any category and I’m not going to apologize for being a blend anymore. I try to be as natural as I can. I love dry brushing, diffusing essential oils, and using green cleaners, but I want to use more than coconut oil on the fine lines on my face. I love eating real, nutrient-dense foods. I’ll have a bowl of roasted veggies for lunch, blend up turmeric tonic for the mornings, and feed my kids sauerkraut but yet I still asked for the garlic sauce when they served Papa John’s pizza at Hailey’s Girl Scout party as I watched the kids eat their second piece of cake for the day. In a day and age when influencers are told to pick a niche and become an expert in that area, I feel out of place. I can’t claim to be an expert in anything other than trying hard to live my “best life” and share the journey along the way. So I’ve decided to let go of feeling like I need to pick a side, a stance, or a niche. Less apologizing; more living. 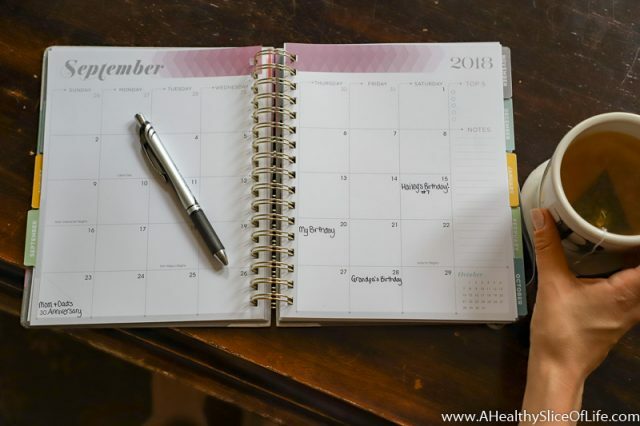 A quick note about my planner: I use an inkWELL Press Flex Kaleidoscope liveWell weekly planner. I really appreciate it’s durability, the sturdy gold coil that allows it to lie flat, and the layout on the interior. It has areas designated for weekly top priorities as well as monthly focuses. This is not sponsored, but I am using an affiliate link, meaning I will get a small kickback of any sale made, with no additional cost to you. If you are looking for a quality, sturdy, and user-friendly paper planner for the upcoming year, I highly recommend checking out inkWELL. Oh! And use the code SLICE20 for 20% off your ENTIRE order! Are there any small things that you would like to do better at? Or any small things you already do that make your life run more smoothly? I like that you periodically reflect/examine your life. Keeps you becoming your best self. Also like that you are a “blend” (not extremes). However, you are not one to “blend in” as you are a natural for being “out there” with your unique Brittany style. John J. recently posted..“Mother Mary Said To Me, Let It Be”: Can You? Thank you! It’s from Nordstrom. It’s on sale now, but they only have blue left! Hello! I’ve followed you for years and love your blog. I’ve never commented before, but this post really resonated with me – loved it! Such great ideas and I’m already incorporating several of the things you mentioned. The “living unapologetically” topic is something that has plagued me for years, thanks for putting it in perspective – so helpful! I love the fact that people are starting to get back in to keeping track of important dates and sending snail mail! I’m a paper and pen girl through and through and while I love getting random, uplifting text, there’s still something so special about opening the mailbox to a card. I’m working on a perpetual calendar for our family so, I always have those dates at the ready and can move them into my planner each month. Also, my mom is the queen of cards and she makes it a point to always do her card shopping two months at a time so, she’s always prepared to send someone a birthday/anniversary card in a timely manner. I’m trying to be more like her. Overall, I’m working on a lot of these same small changes so, it’ll be nice to see how it works for you and get ideas. How are you making your perpetual calendar? Is it a list in Word that you just keep a running tab on? I’d love to do this too! Wonderful post! The one that really resonates with me- living apologetically! I’m definitely not one to apologize, and it has become even more effortless for me with age as I’m about to turn 40. I didn’t have kids until almost 35, and I didn’t get into any social media until I was 37 (finally caved… Instagram was my gateway drug). I keep hearing about all the judgement moms face, but from my experience, the less apologizing, the less judgement. Also probably lack of exposure and “sharing” on social media helps. I can’t recall any specific times I’ve felt judged as a mom, and I am far from a perfect mother. But I think maybe in many cases I don’t allow myself to be judged. Kept my kids up past midnight on vacation?- yes I did and will probably do again. Dress my kids for daycare the night before? Yes, every single night- huge time and hassle savings when you have to leave early for work! Swear sometimes in front of my kids?- Yes, I’m human, just like my mother was. 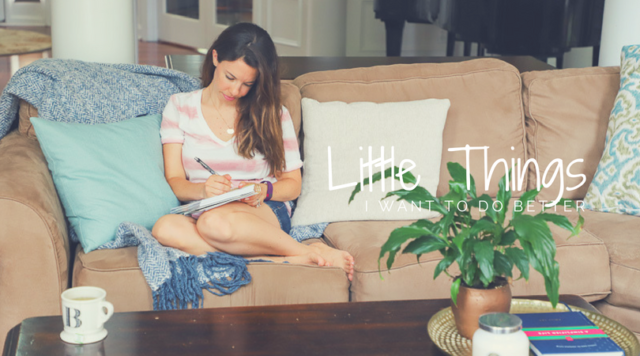 Working mom by choice?- absolutely… I love my career! I feel there is a strong connection between unnecessary apologizing and opening yourself up to judgement. I think people see an open invitation for judgement when someone apologizes continuously (I’m talking about apologizing for me being me, not for things that truly deserve an apology like that time I broke my husband’s new power washer because I was negligent). I also co-sleep, eat (and love!) meat, nurse a 2 year old, and drink a beer more nights than not. There really is no need to pick sides or identify with certain labels. So apologizing less- a win-win! Also, love this quote: “what people say about you says more about them than it does about you”. So the criticism and judgment that we face and the labels we feel we need to fit, really requires no apology. As always, love your insight, Laura! I agree that each year that passes makes me less concerned with the opinion of others, which is a real gift to a recovering people pleaser (me). Also, can I say that I love that you dress your kids for daycare the night before; that is just brilliant!! 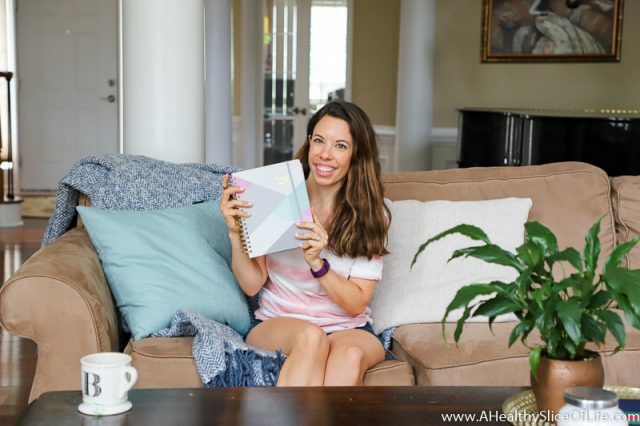 Brittany – I love this for so many reasons – I love that you reflect on things regularly – (most people just wander through their life without ever thinking about it), that you aren’t trying to fit into a box and that you still use a paper planner!! I get teased often for mine but NEVER EVER miss an appointment so its obviously working:) I was slightly bummed when you posted that you may blog less – for selfish reasons! But if the posts are this good when you do post then it will be worth it!! Have a great day! Yes, #teampaperplanner! Mine doesn’t allow things to slip through the cracks either and I love it for that. Thank you for your comment and compliment; it filled my heart this morning <3 I hope you have a great day! Loved this post. Your blog is so authentic, and that’s one of the reasons I enjoy visiting here (along with the great kids recipes)! 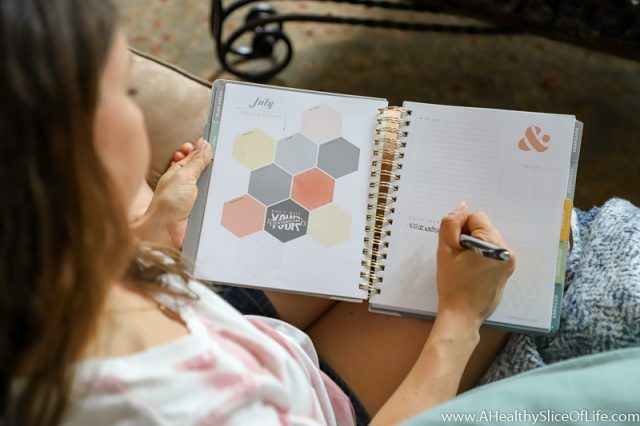 I may need to try out this planner – paper planner girl here all the way, and I was not thrilled with the emily ley one I picked last summer. One little thing I’d like to do better – committing to setting an alarm and waking up 30 minutes before my boys (ages 5 and 2). It’s been over a year since I was in the haze of sleep deprivation, so there’s really no need for me to be banking sleep at 8.5 hours per night anymore, ha! The times I’m up and ready for them, I feel like I can greet them more joyfully (which they deserve). I’m with you 100% on waking up before my kids! It makes me such a happier mom when they rise because I feel like I’ve had a minute to breathe. Let me know if you have any questions about the planner. I’m picky too! What did you not like about Emily Ley’s? I LOVE the idea of bulk buying gifts. That’s fantastic!! Ooh Inkwell Press!!! I love the look of their stuff. We actually interviewed Tonya Dalton, the creator and company owner, on our podcast! Episode coming up 🙂 I couldn’t admit to her that I’m currently using an Erin Condren 😳 Next year I may try hers instead! !